Zoonoses-infectious diseases, such as SARS and mad cow, that originate in animals and spread to humans-reveal how intimately animal and human health are linked. Complicating this relationship further, when livestock are given antibiotics to increase growth, it can lead to resistant bacteria. Unfortunately, there are few formal channels for practitioners of human medicine and veterinary medicine to communicate about threats to public health. To address this problem, Dr. Laura H. Kahn and her colleagues are promoting the One Health concept, which seeks to increase communication and collaboration between professionals in human, animal, and environmental health.In One Health and the Politics of Antimicrobial Resistance, Dr. Kahn investigates the use of antibiotics and the surge in antimicrobial resistance in food animals and humans from a One Health perspective. Although the medical community has blamed the problem on agricultural practices, the agricultural community insists that antibiotic resistance is the result of indiscriminate use of antibiotics in human medicine. Dr. Kahn argues that this blame game has fueled the politics of antibiotic resistance and hindered the development of effective policies to address the worsening crisis.Combining painstaking research with unprecedented access to international data, the book analyzes the surprising outcomes of differing policy approaches to antibiotic resistance around the globe. 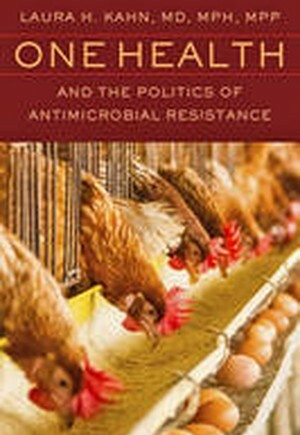 By integrating the perspectives of both medicine and agriculture and exploring the history and science behind the widespread use of growth-promoting antibiotics, One Health and the Politics of Antimicrobial Resistance examines the controversy in a unique way while offering policy recommendations that all sides can accept.